This magnificent Grade-I listed building certainly boasts an extremely colourful history. Built in the early 1600’s for Sir Randolph Crewe, Chief Justice of the King’s Bench, the existing house replaced an even earlier structure. Admittedly, the building underwent additions and alterations during the 19th century, but the fabric of the original Jacobean house remains splendidly unchanged. It should be noted that parts of the interior have a contemporary feel that might not fully appeal to the history-traveller, but it remains a superb piece of British heritage. During the Civil War the house was besieged – and temporarily occupied – by Royalist forces, before being retaken by Sir Thomas Fairfax. Accounts suggest that the former was a particularly bloody affair. Later, during the eighteenth century, the lady of the house, Frances Crewe, arranged numerous parties attended by the likes of the poet William Spencer, the philosopher Edmund Burke, artist Sir Joshua Reynolds, and numerous other high-profile figures of the day. 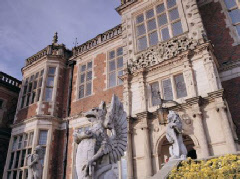 In 1913 the building also played host to George V and Queen Mary for three days.